Obsolete type, use LoudnessLevel instead! Obsolete type, use Loudness instead! Some of the types are derived SI units that are utilized in package Modelica (such as ComplexCurrent, which is a complex number where both the real and imaginary part have the SI unit Ampere). Furthermore, conversion functions from non SI-units to SI-units and vice versa are provided in subpackage Conversions. 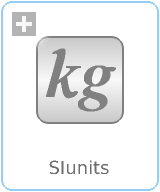 For an introduction how units are used in the Modelica standard library with package SIunits, have a look at: How to use SIunits.